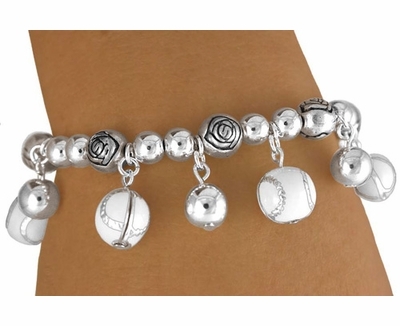 Silver Charm Stretch Bracelets with Lots of Softballs / Baseballs - Softball & Baseball Jewelry, etc. This trendy Silver-Tone Softball Stretch Charm Bracelet features multiple suspending White 3-D Softballs / Baseballs & alternating Silver Ball Charms! A perfect gift for any female softball player, softball / baseball mother, or sisters, daughters, etc. . . or buy them for yourself.